Industrial activity marked the early history of the Schuylkill River and nearby waterways. Even before the fishery of Fort St. Davids was established by Welshmen at the Falls of the Schuylkill in 1734, other settlers were building mills along the Wissahickon and the Falls Creeks. Don’t bother trying to find the Schuylkill Falls themselves, however. The Fairmount Dam, constructed in 1822, raised the river’s water level and obliterated the rapids. The area near the present library was a brewery from 1873 to 1894. After it fell into disrepair, the springs turned it into a swimming hole. 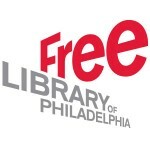 The first library in East Falls opened on June 1, 1901 as a Deposit Station on the second floor of the Old Academy, the first community center in Philadelphia. It was built in 1819 as a place of education and worship. Since 1932, the building has been used as a theater, and was the scene of Grace Kelly’s acting debut. 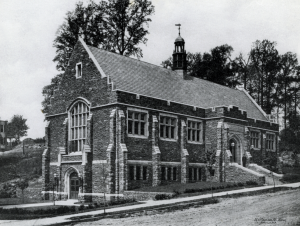 Featuring Collegiate Gothic architecture, the current library opened on November 18, 1913. 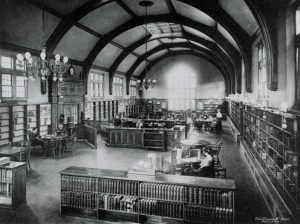 The building was funded by Andrew Carnegie, and the land was donated by William H. Merrick and the Warden Estate. The library was renovated in 1997 as part of the “Changing Lives” campaign, which refurbished branches and ensured Internet access. Atop the library, you’ll see a catfish weather-vane on the cupola. They are symbols of the thousands of catfish that thronged the Schuylkill River two centuries ago, when East Falls was known as Fort St. Davids. One fisherman in the 1830′s caught 3,000 in one night with his dip net. Catfish and waffles were a popular meal in the inns and taverns that surrounded the river. While you visit, take a look at the beautiful gardens outside the library. The library has two gardens, the one on the Midvale side, which is maintained by the committee that was formed in the late 80s, and one on the Calumet side, a shade garden, which is maintained by a committee of two with help from Penn Charter Students twice a year. In 2011, the library was approved by the Philadelphia Historical Commission for inclusion in the Philadelphia Register of Historic Places.